vii, 88 leaves : ill. ; 29 cm. Includes bibliographical references (leaves 62-66). people who deserve special thanks for their contributions to my success. Academically, I have had many role models pointing me toward success. This dissertation is the product of many years of effort by many people. have not forgotten them and I am grateful for their assistance. unpleasant pictures facilitate the startle reflex while pleasant pictures inhibit it. determine whether the pattern of responses changes with age. was measured as EMG activity of the left orbicularis oculi. however, looked at unpleasant pictures longer than both pleasant and neutral. unpleasant slides less arousing than did adolescents or adults. measurement of affective state in children is also discussed. a variety of response systems to affective pictures changes as a function of age. emotions can be understood in terms of dimensions. organism at the time of measurement (Lang, 1995; Lang et al., 1990; Lang et al. proposes that there are a limited number of motivational situations for an infant. recognized as the full spectrum of specific emotions humans report. investigate how particular stimuli are represented in the two-dimensional space. wide-eyed figure to a relaxed, sleepy figure for the arousal dimension. an 'X' over any of the 5 figures in each scale, or between any two figures. Figure 1. The self-assessment manikin used in normative rating studies. elicited by these materials (Bradley, Greenwald, & Hamm, 1993). averaged across subjects to produce a mean score on that factor for each slide. SAM rating for the slides were very high. emotional dimensions can adequately describe certain emotional experiences. emotional concepts in terms of valence and arousal. arousal factor with words like "sleepy" on the negative end and "full of energy"
biphasic dimensional model of emotions. provided and also to rate them on the dimensions of pleasure and arousal. complete instructions read to the children. undergraduates were .95 and .88 for pleasure and arousal, respectively. undergraduates (.96 for pleasure and .90 for arousal). of children's verbal responses to pictures. imagining scenes related to their specific phobia. measures can index fear in adults and children. rate, skin conductance, and corrugator and zygomatic EMG were all recorded. showing greater orienting to the unpleasant pictures. are reliable measures of affective responses in the human. unpleasant, matching the valence of the elicited startle, the startle is enhanced. that is modulated by the affective valence of the material being processed. larger than an eyeblink elicited during exposure to pleasant stimuli. 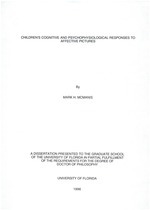 response in adult humans was conducted by Vrana, Spence, and Lang (1988). behavioral measures that were included in this study. children's responses, but all age groups are expected to rate them similarly. when viewing unpleasant pictures relative to pleasant and neutral pictures. reflected in changes in skin conductance, orbicularis oculi, and viewing time. affective dimensions will be explored. (15 female, 15 male) from the University of Florida participated in this study. until 250 ms after probe onset. calculated off-line following Graham (1980). the present study for children, adolescents, and adults, respectively. pictures in the normative study. the procedure if the child or parent requested. delivered before the first slide was presented. debriefed and received their compensation. Average values for each half-second of data collection were computed. the same manner as corrugator, as was skin conductance. baseline orbicularis oculi activity before the probe was delivered. study are listed in appendix C.
below .80 for female children and down to .50 for male children. Study and the Laboratory Study. pictures, there were no age differences. for males and females participating in the present study. unpleasant pictures less arousing than adults or adolescents. children different from both at each valence category. for males and females participating the present study. rate the unpleasant pictures less arousing than the pleasant pictures. dimension were rank ordered within each subject, following Lang et al. (1993). Figure 10. Mean arousal rating for picture valence categories by age group. different levels (1 through 27) of the affective dimension (pleasure or arousal). 1993), there is an increase in skin conductance as rated arousal increases. Figure 11. The relationship between changes in corrugator activity and subjects' own pleasure ratings. -0.1 .. -0.1 I 1-0.1 . Figure 12. The relationship between changes in skin conductance and subjects' own arousal ratings. The relationship between changes in heart rate and subjects' own pleasure ratings. Figure 14. The relationship between startle magnitude and subject's own pleasure ratings. other studies (Greenwald et al., 1989; Lang et al., 1990; Lang et al., 1993). children, moving to a negative relationship in young adults. Affective categories are based on normative ratings of slide valence. therefore, are to a given set of stimuli of a particular valence category. viewing pleasant, neutral, and unpleasant pictures. Independent MANOVAs were done separately for each age group. neutral and unpleasant, for both genders. pleasant, neutral, and unpleasant pictures. an increase in skin conductance associated with viewing unpleasant pictures. direction as the other age groups, but the differences were not significant. while children and adolescents exhibit more deceleration to unpleasant slides. for pleasant, neutral, and unpleasant pictures. gender, nor any interactions with valence. Figure 16. Psychophysiological measures for each valence category by age group. highest level of activity. There were no interactions with valence. and peak latency, showed no significant difference. while viewing pleasant, neutral, and unpleasant pictures. relative to neutral pictures, F(1, 28) = 5.16; 2 < .04. Table 11. Mean viewing time for pleasant, neutral, and unpleasant pictures. dimensions of pleasure and arousal. states in children as young as seven years of age and adults in their twenties. the moderate and high arousal pictures in the Cuthbert et al. (in press) study. = -1.79; p < .05, for unpleasant pictures. used in Cuthbert et al. (in press). higher affective ratings for the pictures. in the context of other emotional responses in the following section. picture paradigm is an effective method of investigating emotional development. a complex pattern of affective responding within this paradigm. differences in judgments found between the two studies. responses to probes during unpleasant pictures were not as expected. unpleasant pictures lower in arousal than did their peers in the normative study. later section, this issue can be resolved in future studies. categories, based on normative ratings were used to organize the stimuli. while viewing unpleasant versus pleasant pictures. the pictures, increasing their emotional responses. ratings and physiological measures were generally related. comparable stimuli in this study, this could reduce the effect. startle response may be due to the stimuli used in this study. paradigm, thus, less modulation of affect measures could be expected. arousing material makes the adult heart rate inconsistent with previous studies. Cuthbert, Schupp, McManis, Hillman, Bradley, & Lang, 1995; Lang et al., 1995). consistent with the idea that they were under arousing. effects of these television programs on children. Reactions to facial expressions of emotion. Child Development. 66, 28-36.
of facial emotions. Journal of Genetic Psychology, 154, 375-382. Emotion or attention? Psychophvsiology, 27, 513-523.
emotions (pp. 48-65). Hogrefe-Huber: Toronto. Society for Psychophysiological Research. San Diego, California. startle reflex: Habituation in humans. Behavioral Neuroscience, 107, 1-11. The Center for Research in Psychophysiology, University of Florida. Cook, E. W., Melamed, B. G., Cuthbert, B. N., McNeil, D. W., & Lang, P. J. (1988). Consulting and Clinical Psychology, 56, 734-740.
perception: Activation and emotion, Psychophysiology. organization of emotions (pp. 93-109). Hogrefe-Huber: Toronto. P. J. (1995). Cortical slow waves: Emotional perception and processing. to a special section on the development of emotion regulation. Ekman, P. (1984). Expression and the nature of emotion. In K. Scherer & P.
and how they organise development. Cognition and Emotion, 4, 81-127.
past. Journal of Narrative and Life History, 1, 325-341.
the development of emotion. American Psychologist, 46, 863-872. Graham, F. K. (1980). Representing cardiac activity in relation to time. In I.
Martin and P. Venables (Eds. ), Techniaues in osychoohysiologv. of pictorial stimuli. Journal of Psychophysiology, 3, 51-64.
blink reflex. PsychoDhysiology, 28, 588-595.
processes in Pavlovian conditioning [Abstract]. Psychoohysiology. 27, S37. of two emotions: A five stage developmental acquisition sequence. approach. Chicago: University of Chicago Press. (Eds. ), Technology in mental health care delivery systems (pp. 119-137). disorders (pp. 131-170). Hillsdale, NJ: Erlbaum. Lang, P. J. (1995). The emotion probe: Studies of motivation and attention. startle reflex. Psychological Review, 97, 377-398.
pictures: Affective, facial, visceral, and behavioral reactions. psychology. Cambridge, MA: MIT Press. Melamed, B. G., Yurcheson, R., Fleece, E. L., Hutcherson, S., & Hawes, R.
situation. Journal of Clinical and Consulting Psychology, 46, 1357-1367.
children's drawings. Perceptual and Motor Skills. ZZ, 11-15.
and Social Psychology, 48, 1290-1298.
concepts. Developmental Psychology. 19, 795-804.
flow rates in asthmatic children, Psychosomatic Medicine. 38, 190-200.
new measure of emotion? Journal of Abnormal Psychology. 2Z, 487-491.
differences and implications for the development of depression. In J.
dysregulation (pp. 243-272). New York: Cambridge. feeling important, being a leader, and feeling unimportant or bullied. scale. Order of the dimensions on a page was randomized across trials. Subjects were run in groups of 8 to 25, depending upon each class size. lighting conditions for each group. years. There were 47 (25 females) children ranging in age from 10 to 12 years. consisted of 20 (10 female) college undergraduates, 18-23 years old. Assessment Mannequin is a useful measure of children's feelings. does not want to go can stay here and continue working. back to the classroom. Does everyone understand? This is very important. can see the number three, like this (show correct side). looked at the slide by marking the picture of SAM that best shows how you felt. Looking at the page, you see that the first row has five pictures of SAM. a very unhappy SAM to a very happy SAM. (Turn on slide projector). pictures of SAM, like this. excited, you could put an X between pictures of SAM, like this. The third row shows SAM very little and getting bigger and bigger. very big or like you don't need anyone's help. This is when SAM looks very big. You can use this row to show how you felt when you saw the slide. (Adv. the slides and your feelings after the experiment is over. time during the experiment, you can go back to the classroom. to tell us how the picture made you feel. the joystick back and forth. felt a little bit happy, you can make SAM smile just a little bit. button on the joy stick to record your answer. Then the next rating will come up. Remember to move the joystick back and forth. slower and the dots will move around slower. record your answer and then the next rating will come on. Now you need to move the joystick back and forth again. can make SAM only a little bit small. and then press the button on the joystick. Let's do another practice. Let's do one last practice to make sure you can remember everything. and quality, as a dissertation for the degree of Docr fIlosophy. and quality, as a dissertation for the degree of Doctor of Philosophy.